How much money you will make in the military is a little more complicated than "do eight hours of work and get paid for eight hours." How much you will make in the military depends on several factors. This is sometimes called "basic pay." Everyone on active duty receives base pay. The amount depends on your rank, and how many years you've been in the military. For example, the lowest ranking enlisted member—someone in the paygrade of E-1—with less than two years of service, makes a base pay of $1,681 per month. A 4-star general (O-10), who's been in the military for 30 years, takes home $19,673 per month in base pay. While members on active duty (full-time duty) receive base pay, members of the National Guard and military Reserves get monthly "drill pay." The amount of monthly drill pay depends on how many drill periods a person works during the month, their military rank, and the number of years they have been in the military. Most Guard and Reserve members perform one weekend of drill per month. Each weekend counts as four drill periods. A member of the National Guard or Reserves receives one day's worth of base pay for each drill period. A Guard/Reserve member in the lowest enlisted rank (E-1), with less than two years in the military, would draw $207 for a weekend of drill. A full-bird colonel (O-6), with more than 20 years in the military, would make $1,373 for a weekend of drill. When a member of the National Guard or reserves is performing the full-time duty (such as in basic training, military job school, or deployed), they receive the same pay as active duty members. Military recruiters promise "free room and board." The "room" part of this promise is accomplished through the military's housing program. Enlisted members who are fairly new to the military, and do not have a spouse and children generally live in a military barracks (dormitory). Because military barracks generally do not meet minimum military housing standards required by law, most people who live in the barracks also receive some compensation each month for their inconvenience, in the form of partial housing allowance. Except for basic training and military job school, the standards for most of the services now include a single room for each person, with a bathroom shared by one or more others. As enlisted members progress in rank to above E-4, they are usually given the opportunity to move off base to rent a house or apartment, receiving a monthly housing allowance. At many locations, lower-ranking enlisted members can also choose to move off base, if they wish, but it will be at their own expense. Married individuals, or those who reside with dependents, either receive an on-base family house rent-free or they receive a monthly housing allowance to rent (or buy) a place off base. The amount of the monthly housing allowance depends on the member's rank, the location of assignment, and whether or not he or she has dependents (spouse and children). Members of the National Guard and Reserves are also entitled to a housing allowance when on full-time active duty. However, it works a little differently. If the Guard/Reserve member is on active duty (full-time duty) for 30 days or longer, they receive the same monthly housing allowance as do active duty members. However, if they perform active duty for less than 30 days, they receive a different housing allowance, which usually pays less and doesn't depend upon the member's location. Guard and Reserve members do not receive a housing allowance when performing weekend drill duty. All active duty military members receive a monthly allowance for food, called Basic Allowance for Subsistence. Commissioned and warrant officers receive $254.39 per month, while enlisted members receive a monthly food allowance of $369.39. However, lower-ranking enlisted members who live in the barracks are generally required to consume their meals in the dining facility (chow hall), so the amount of the food allowance is immediately deducted from their paychecks. Therefore, they get free meals, so long as they eat those meals in the chow hall. Officers and enlisted members who live off base or in family housing, as well as higher-ranking enlisted members, do not receive free meals in the chow hall. Instead, they receive the monthly food allowance. If they choose to eat in the chow hall, they must pay for each meal. Those on a "meal card" (free meals in the chow hall), can claim a "missed meal" if they are not able to eat a meal in the chow hall due to duty reasons. If the commander approves the "missed meal," then the member receives the cost of that meal in their next paycheck. Military members who are assigned or deployed to a location where their spouse and children are not allowed to travel at government expense are entitled to a monthly family separation allowance for each month they have been forcibly separated from their dependents after the first month. The amount of the allowance is $250 per month for all ranks. The purpose of FSA is that it costs more to maintain two separate households than it costs to maintain a single residence. This includes military basic training (after 30 days), and military job school (if dependents are not authorized). Through September 30, 1980, FSA was payable to a member serving in pay grade E-4 (over 4 years of service) or above as a member with dependents. Effective October 1, 1980, FSA became payable to a member serving in any grade as a member with dependents. Effective October 1, 1985, through January 14, 1991: $60 per month. Effective January 15, 1991, through December 31, 1997: $75. Effective January 1, 1998, through September 30, 2002: $100. Effective October 1, 2002 (and through to 2019 and beyond): $250. If the dependents are authorized to accompany the military member at government expense to the location, but the member voluntarily elects to serve an unaccompanied tour, FSA is not payable. Effective January 1, 1998, FSA has been payable to a member married to another member regardless of whether the member has any nonactive duty dependents when all other general conditions are met, and provided members were residing together immediately before being separated by reason military orders. Not more than one monthly allowance may be paid concerning a married military couple for any month. Payment is made to the member whose orders resulted in the separation. If both members receive orders requiring departure on the same day, then payment goes to the senior member. Military members who are assigned or deployed to a designated combat zone are paid a monthly special pay, known as combat pay (or Imminent Danger Pay). The amount paid is $225 per month for all ranks. Even if a military member only spends one second in the designated combat zone, he or she receives the entire amount of the monthly combat pay for that month. 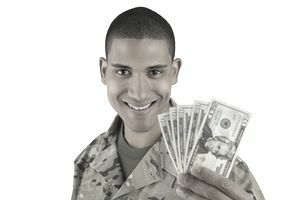 Not all military pay is subject to federal or state income tax. Because this pay goes into the military member's pocket, instead of the government's pocket, this is like getting a few bucks extra each month. In most (but not all) cases, if it's called "pay" (such as "basic pay"), it's subject to income tax. If it's called an "allowance," (such as "Basic Allowance for Housing," or "Subsistence Allowance"), it's not. For duty performed in a designated combat zone, all income earned by enlisted members or warrant officers is tax-exempt. For officers, the amount of income that is tax-exempt in a combat zone is equal to the maximum amount of base pay paid to the highest-ranking enlisted member. For 2019, that's $8,241 per month. New military members who enlist with a contract to be trained in, and perform a job that the military considers "critically short-manned" are entitled to an enlistment bonus. The amount of the enlistment bonus is usually included in the enlistment contract and can range from $1,000 to over $50,000. Enlistment bonuses are usually paid in a single lump sum, once the member completes initial entry training (basic training and military job training), upon arrival at the first permanent duty station. Military members who are serving in a "shortage" job, and agree to re-enlist in that job (or re-train into that job) for another term may receive a re-enlistment bonus. The amount of this bonus can be from $1,000 to over $90,000 for a four-year re-enlistment period. Unlike initial enlistment bonuses, re-enlistment bonuses are usually paid in installments: one-half at the time of re-enlistment, with the remainder of the bonus paid in equal yearly installments on the anniversary of the re-enlistment date. If the member re-enlists while in a designated combat zone, then the entire re-enlistment bonus is tax-free regardless of when it is paid. A few low-ranking enlisted members with lots of dependents may qualify for a "Family Subsistence Supplemental Allowance," of up to $1,100 per month. If a military member accepts this allowance, he or she may no longer apply for food stamps. Military uniforms can be expensive. Military members are issued a complete set of uniforms during initial training. After that, it's up to the military member to replace uniform items as they become unserviceable or wear out. Enlisted members are given an annual clothing allowance to help them with this requirement. The clothing allowance is usually paid annually on a member's enlistment anniversary. Those with fewer than three years of service receive the basic rate, on the assumption that their uniforms are still fairly new and don't need to be replaced as much. Additionally, their first annual payment will be only half of the basic rate, which assumes that little would have to be replaced during their first six months of service. After three years of service, enlisted members receive the standard rate each year. Officers may be reimbursed up to $400 for the initial purchase of required uniform items, and up to $400 per year after, for uniform replacement. By regulation, military members must provide "adequate support" to their dependents. Military members who live in unaccompanied quarters (barracks) and pay court-ordered child support receive the difference between the single and dependent rate of the military transitional rate housing allowance. This pay is called "Differential Pay." However, to receive this pay, the amount of the court-ordered child support must equal or exceed the amounts authorized. If the amount of the court-ordered child support does not equal or exceed the amounts shown on the chart, the military member does not receive this allowance. The amounts payable range from $168.60 per month for a low-ranking enlisted member to $319.80 per month for a high-ranking general. Flight Pay: Military members who perform regular flight duties are entitled to special monthly flight pays. Hazardous Duty Pay: Military members who perform duties which are considered "dangerous," due to the nature of the job, are entitled to monthly hazardous duty incentive pay. Diving Duty Pay. Each branch of service has specific qualification requirements for members to receive Diving Duty Pay. In general, these divers must be designated divers by order, training, and assignment. Sea Pay. Military members performing duty at sea are entitled to special monthly pay, known as "Career Sea Pay." Submarine Duty Pay. Military personnel (mostly Navy) who perform operational submarine duty are entitled to receive Submarine Duty Pay. How Much of a Bonus Do You Get to Reenlist?